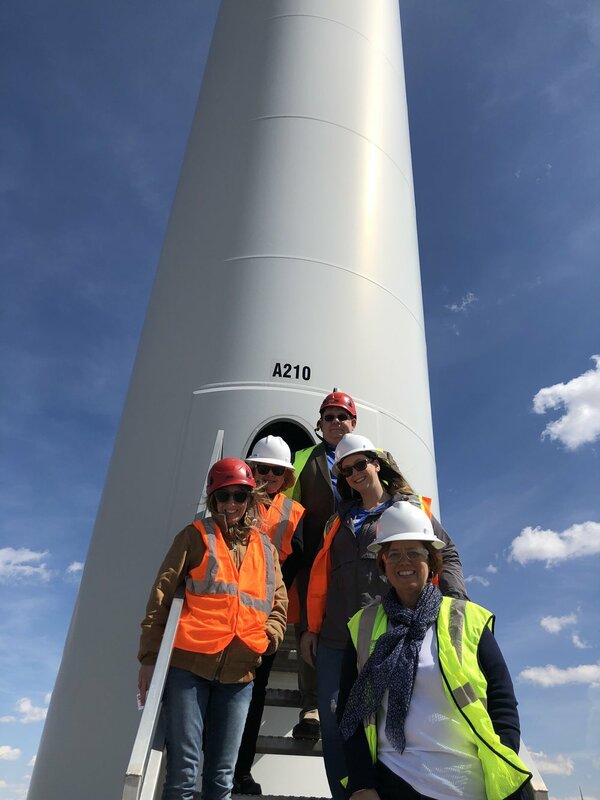 A perfect, windy day to see a turbine up-close at EDP Renewables Timber Roads II in Paulding County. Susan Munroe, Chambers for Innovation and Clean Energy. How much can clean energy development grow a region's economy? Quite a lot, as a Toledo Blade newspaper reporter and the Ohio Governor's regional representative got to find out in a day-long tour earlier this month by the Chambers for Innovation and Clean Energy in partnership with the Paulding Chamber of Commerce, school district superintendents, and economic development officials. The day-long tour spotlighted a region of Ohio where several wind farms are already constructed and have been operating for several years. It provided a close look at how economic activity from wind power reaches far beyond the boundaries of wind farms into businesses, school districts, local governments, and community philanthropies. The wind farms benefit communities throughout Ohio that are located along the wind supply chain. One of the most intriguing stops during the tour for Toledo Blade Reporter, Tom Henry, was an up-close look at Vantage's Nacelle Wind Power Generator Simulator. "One of the highlights of the visit there was an $80,000, micro-sized wind turbine simulator that could help train future operators, or at least whet their appetites for mechanical science and physics," says Henry. The technician training program is right on time - since one of the top new jobs in the county is a wind turbine technician with an average salary of $54.360 according to U.S. Department of Labor Statistics. Another highlight of the tour included a visit to the new $4.5 million community center built by the Lincolnview School District with revenue from wind investments. Lincolnview is receiving $400,000 annually for 20 years from wind revenue. Superintendent Jeff Snyder noted that these steady payments allow the school district to plan for the long-term and to fund ambitious projects like the community center. Lincolnview School District Community Center; built with revenue from wind investments. In between stops, the tour also highlighted businesses receiving spin-off economic activity from wind farm construction and maintenance--including a hotel, cement plan, auto dealership, trucking company, and more. See the Toledo Blade story and video here. Several local chamber, economic development leaders, and community officials traveled to the state capitol on multiple occasions in 2017 to share their front-line stories about the benefits of wind with state government leaders.